pouporri • civilized ku / ku ~ flogging a dead horse? From time to time I come across something, most often something written, which gets me ruminating on a subject, in this case the medium of photography and its apparatus. Most recently, while searching for something different, I came across a online piece addressing how to make better landscape / nature pictures. In that piece, the author addressed what he considered to be the shortcomings of the "traditional" landscape / nature picture. In a nutshell, a "successful" traditional landscape picture depends upon the primacy of its referent(s) in order to be considered a beautiful picture. In other words, pictures in which dramatic referents are pictured in dramatic light / atmospherics with saturated color a plus. Here in the Adirondack PARK (it's actually a forest preserve), there are a handful of picture makers dedicated to making "traditional" landscape/nature pictures. In addition to them, there is a continuing flood of legions of "serious" picture makers coming into the region with the same picture making intent. iMo, they are all engaged in making pictures which, to my eye and sensibilities, are all somewhat minor variations on the the same "standard" landscape/nature picture. Re: my history, re: landscape/nature picture making - my "serious" Adirondack picture making began circa 1980. All of that picture making was accomplished using and 8x10 Arca Swiss view camera with TYPE L (3200K/long exposure) color negative film*. Since my intent was to create very high quality (technically) prints, the use of an 8x10 view camera was a no-brainer, as was the choice of color negative film. Aesthetically, my intent was to create pictures which fell into the traditional landscape/nature genre albeit with a slight twist ... I limited most of my picture making to that time of day known in some quaters as entre chein et loup, aka: between the dog and the wolf. A time when the sun has set but some daylight lingers on. My referents could also be considered to be of traditional iconic Adirondack stuff. 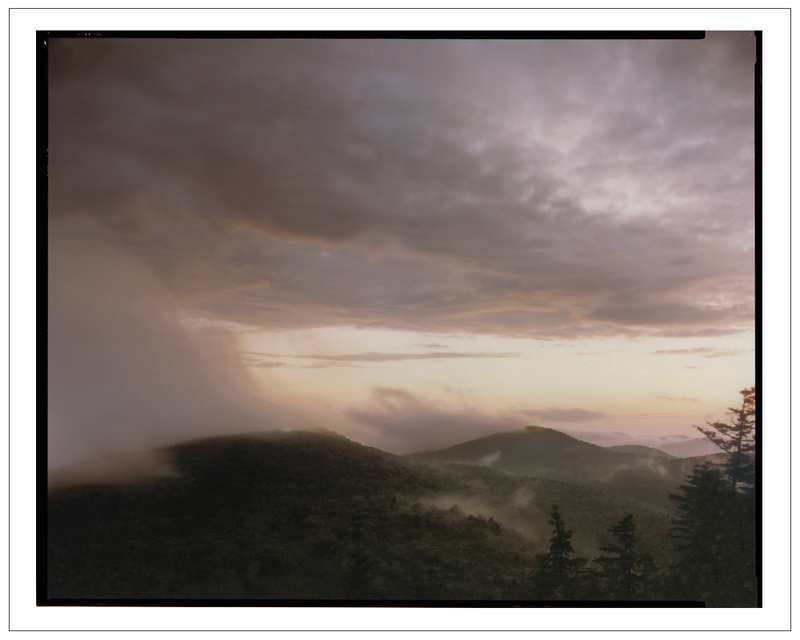 Judging by the substantial prints sales of those pictures, I apparently it the sweet spot of Adirondack picturing. However, in 1985, I moved to a place far enough away from my then easy access to the Adirondacks and my Adirondack picture making waned almost entirely. That situation changed in 2000 when I moved to the Adirondack PARK where I now reside. And, over the intervening years, actually decades, something else had changed. I was no longer interested, flogging a dead horse as it were, in making traditional landscape/nature pictures. That is to write that I was no longer interested in making pictures in which the primacy of the referent(s) was the thing. Rather, I was interested in making pictures in which the visual qualities / characteristics, independent of what was depicted, as they appear on the surface of the 2D print are what defines those pictures that are "beautiful". Quite simply, that is to write, making pictures which, when the image resides on the surface of a print, a thing in and of itself, is considered to be a beautiful object. That written, I am re-issuing a series of my "vintage" Adirondack pictures. The reason for that is quite simple ... I have recently discovered that there is still (and most likely always will be) a considerable market for such work. So, why not? FYI, the 2 Castle Rock pictures above were made one evening and the following morning. I stayed on Castle Rock over night along with the 10,000lbs of picture making gear (or so it seemed on the hike up to Castle Rock) needed to make an 8x10 color negative picture. I had no advance notice of the atmospherics which presented themselves, almost on cue. Strickly a case of f45 and be there. * low light, small aperture (f45, although it might have been f64) and ASA 100, resulted in shutter speed of 20 minutes. Hence TYPE L color negative film which was developed to compensate for the recoprocity effects of long exposure, Although, a 20 minute exposure was severely pushing the boundary of that compensation.